After 12 years and over 2500 shows around the world with blues master, Michael Burks on Alligator Records, Wayne Sharp is a recognizable and known blues talent on the international circuit. He's sung and played Hammond B3 organ from Australia to Russia. His last album with Michael Burks, Show of Strength, has garnered four Blues Music Awards nominations for the 2013 April awards. During Wayne's career with Michael Burks, they received 14 Blues Music Awards nominations on a total of four CD's for Alligator Records. Since Michael Burk's untimely passing May 2012, Wayne has opted to do what he has alwarys done... keep playing the blues! On this CD, Wayne's passionate vocals are finally unleashed. So in that spirit, this album represents the rekindling of a dream. This new project is uniquely exciting in that it also involves, Terrence Grayson from the Michael Burks Band, as well as his sons, Sean and Grayson Sharp. Rounding out the ensemble is guitarist Jon Woodhead (Ace, Leon Russell, Maria Muldaur, Jon Stewart). On the CD, we were also fortunate to enlist the talents of Jimmy Hall (Wet Willie, Hank Williams, Jr.), and the Legendary Jackie Avery (Otis Redding, Johnny Taylor, Chi-lites, Aretha Franklin, Wilson Pickett and many more) on a few tracks. As he always did with Michael Burks, Wayne brings the passion and spirit to the music that you've come to expect... always professional and ready to shake the house down! So do yourself a favor, check out the new Wayne Sharp & The SharpShooter Band's album, "Living With The Blues", and prepare to join us on the road for those rocking times we all live for. 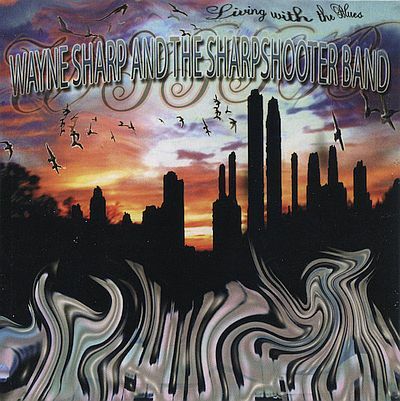 Wayne Sharp, the "Cajun soul healer", will put a smile on your heart... after all, we're ALL, Living With The Blues!